After staying away from baked meringue in general, I am finally coming to the conclusion that I may like it after all! I had tried pavlova ages ago and had not taken much of a liking to it. Since then I have been paying little attention to meringue based recipes. When I asked for a recipe for flour less cookies, the Google Gods directed me to Purple Foodie's Flourless Hazelnut Cookies. They looked so delicate and pretty! No butter, no oil, just whipped egg whites, sugar and ground nuts. Not intimidating like French Macarons, so not much to lose! Shaheen's description of their aroma makes you feel like scrounging around for some hazelnuts, but then good quality ones are not so easy (or cheap!) to find. So almonds it would have to be. If there are going to be almonds, can coffee be left far behind? It would weigh on my conscience if I did not mention that there is a possibility I may not got these the way they are meant to be. 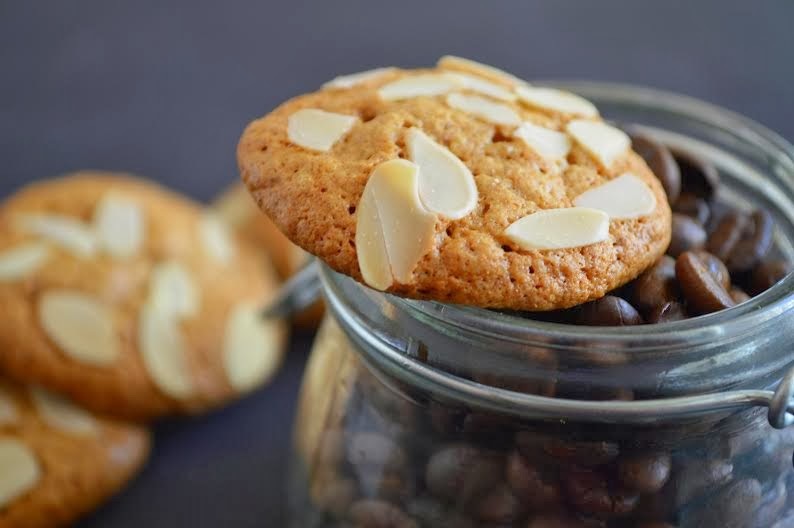 Having never baked macarons, I realized half a cup of almonds and a fourth of cup of sugar are quite a bit to be folded into the whites of one egg. Though you can't possibly fold in the nuts and sugar without deflating the whipped whites to some extent, am not sure how much of it is alright in these cookies. But I am going right ahead and posting these as I found the cookies quite light, nutty, tender-crunchy and delicious! Even assuming my cookies are not quite there, the results you can get can only be better! 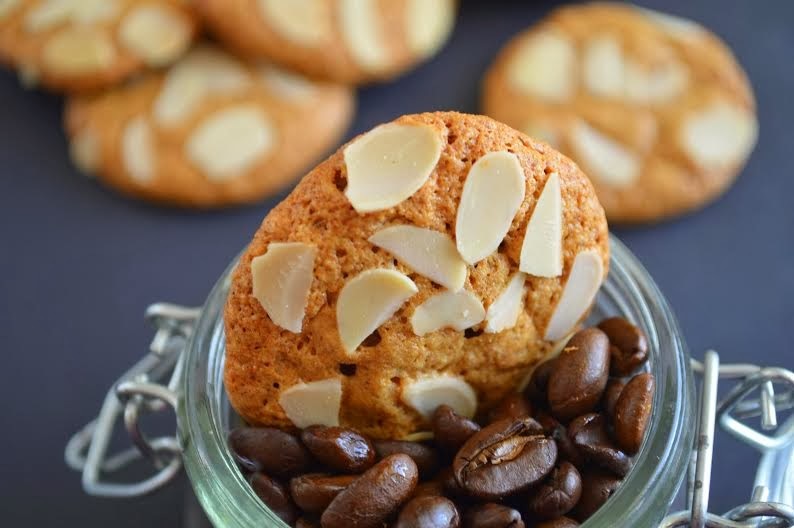 Apparently, these Italian cookies are called Brutti Ma Buoni literally meaning, “Ugly But Good''! Below is half the recipe on Shaheen's blog. Please do double the recipe if you can bake them all at one go. Recipe from here, original recipe here . Preheat to 160°C/325°F. Line two baking sheets with Silpat or parchment paper. Put the whole almonds in a plastic cover, close and bash with a rolling pin to break them into uneven pieces. This will help you grind them fine without getting them oily. Pulse nuts, coffee (or zest) and sugar in a food processor or the smallest jar of your mixie until finely ground. Short 10-15 second turns, 2 times at the lowest speed will be good. Be sure not to overdo this as you need this to be like fine meal, not clumped up nuts and sugar. Make sure your bowl and beaters for whipping egg whites are squeaky clean. Beat egg whites on low speed till you seem it foaming. Add the cream of tartar and beat on medium speed (3 on hand mixer) till you see traces of the beaters on the whites. This will look like shaving foam now. Add the powdered sugar slowly and continue beating on medium speed till stiff peaks form. When you raise the beaters slowly, the whites will stand up straight and not droop right away. If you are not there yet, continue and check after about 10-15 seconds. Be wary of over whipping as it will make the whites go dry. Using a silicone spatula, gently fold in the nut mixture into the whites ( I added in two additions). If adding vanilla or any other flavoring, you can add now when you fold in the nuts. The mixture looked quite heavy but foamy. Is this how it works in this recipe?? The moment of tragedy when my dreams of baking French macarons were completely shattered! I made cookies with half tablespoon batter each leaving about an inch space in between the cookies. They spread as they bake. 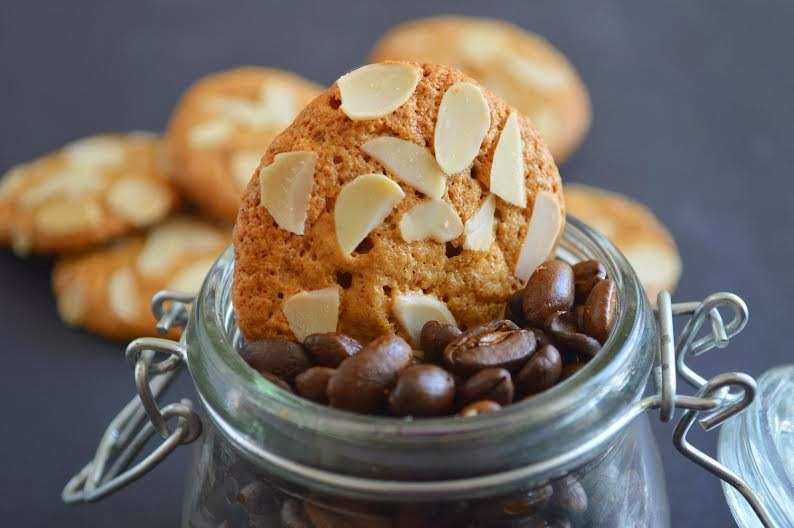 Gently drop almond flakes on top of the cookies. Rap the baking sheet a couple of times over the counter. Bake for 22-24 minutes. The cookies will feel firm all over. If the center is softish, bake a couple of minutes more. Cookies which feel softish in the center will have chewy centers. Cool the cookies on the tray for about 5 minutes. Store airtight. 1. 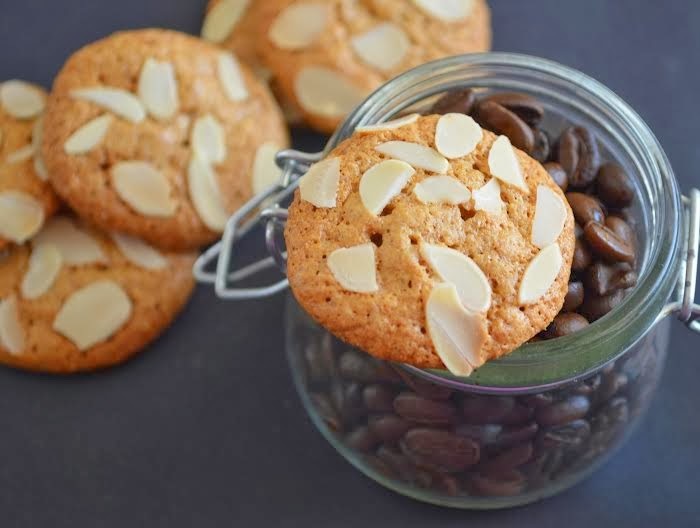 Blanched or un blanched almonds make a difference to the color of the cookies, since I have used coffee I have used them as is. 2. If adding coffee or zest, add all at one go when you grind the nuts. Repeated addition of flavoring and grinding repeatedly however briefly makes the nuts turn oily. 3. Shaheen has reduced the sugar from the original recipe, I have added one tablespoon more and this was just fine with the coffee. Please alter the amount of coffee to taste. 4. Reading recipes for French macarons, folding in nuts into the whites seems to be acceptable. So no concerns on that count. Pretty or not, perfect or not, I loved them the way they turned out, am making these again! Long before butter and cream became the major culprits for shrinking my clothes, I had a standard dessert I would make quite often. Super rich and creamy, delectable Basundi. As a just married, new entrant in a kitchen all my own, the thought of cooking three meals a day was intimidating enough. I honestly don't remember making much at home by way of dessert as frequent visits to Baskin Robins and Corner House more than took care of the sugar cravings! The perfect time to make this sweet dish was when the (only) gas cylinder was just replaced. The luxury of having the stove on for 3 hours non-stop without the fear of it flickering away half-way through! And then, chill it and present it to hubby with all the pride of a new bride in the kitchen. The left-overs would only taste even better eaten while I read my Sidney Sheldons and Mills and Boon! The aroma of saffron from these tuiles lingered in my memory long after they were eaten. Milk and saffron were made for each other, (well, Romeo and Juliet can come later if you insist as it's Valentine's Day!) and I just had to make basundi! Brother and sister-in-law coming over for dinner was the perfect excuse to put that whole milk on the stove. Rich desserts are lighter on the conscience when meant for company! My preferable time of the day to make basundi is after the lunch is cooked, when I do not have rasam or kadhi simmering on the next burner. Am all set with music and a book as all I need to do is just hang around the place and stir the milk as and when it calls for attention. Made early in the day, there is enough time for the pudding to chill and thicken further, dessert's ready by dinner time! The basic recipe and the procedure broadly remain the same, slight variations depending on your preference and convenience. I like to put the milk on sim, though it takes a good 2 hours plus to reduce it. Lesser chances of the milk burning, a little easier on your arms and the milk tastes so good after simmering for so long! Please do it as you like. Basundi : Creamy Milk Pudding laced with cardamom and saffron. A lovely summer dessert! What you need : You will need a wide, thick bottomed kadhai / deep pan, big enough to allow stirring without the milk spilling out. A good strong ladle or a flat slotted skimmer to help break the layer of cream on the top of the milk effectively. A small clean plate near the stove to keep the ladle on when not in use. Be sure everything you use is really clean, free of any acidic substances as it may cause the milk to split. A small cup to soak the saffron in. Extra chilled milk and powdered sugar to adjust the consistency if needed on chilling. Bring the milk in the pan to a boil, reduce the heat to low..
Reserve 2 tablespoons of hot milk from the pan, soak the saffron in it, cover and let infuse. Simmer the milk on low, checking every 8 -10 minutes. Using the ladle or skimmer, scrape the cream at the sides as and when it forms, back into the milk. Break the layer of cream on top with continuous, stirring motions on the surface of the milk. Its important to break the layer of cream which will keep forming on the top too. Or you will end up with long bits of dry-ish cream in the milk. (Some people do prefer it that way). Avoid scraping the bottom as you may get unappealing brown bits here and there. Continue doing this every 8-10 minutes or so, while you keep a constant watch on the milk. Do not let the milk boil over or form too thick a layer of cream on top. Do not leave the milk unattended for more than 10 minutes. What we want to do is let the milk reduce, while scraping back every bit of cream into the simmering milk. What you do want is very thick pudding, full of bits of soft cream (not smooth like condensed milk, not grainy like mava / khoya). It will have lots of soft cream bits, but will still be homogenous. The milk will become very thick and reduce to almost a third. You can reduce more or less as you prefer. This takes about 2.5 hours. Do remember, the pudding will thicken further on cooling. The time will vary depending on the quantity you are making, the pan and the heat given, so go by what you see in the pan. Five minutes before you turn off the heat, add 6 tablespoons sugar and the saffron infused milk. This may alter the consistency slightly, but the basundi will thicken again as it cools. Once you take it off the heat, cool, add the cardamom powder and the sliced pistachios. Taste. Add some powdered sugar if needed. Chill thoroughly. If the pudding is very thick on chilling, add some chilled milk little by little to adjust the consistency. Serve chilled, garnished with sliced pistachios. Please note : Use whole milk with at least 4.5% fat for best results. Low fat milk will neither give the consistency needed nor enough yield. You could use a touch of rose water if you wish. Milk chocolate brownies??!! Did I hear you say that? Promise I won't be surprised or take offense that you frowned at these! That's the expected reaction from dark chocolate loving palates. No, I haven't shifted loyalties to milk chocolate, though Cadbury and Campco will always hold a special place in my heart. Nostalgia! It was a special treat back then, when dark chocolate had not made an appearance yet, at least where we lived. It made the perfect dessert for my school picnics and other smaller special occasions. I remember eating just one piece of my Cadbury bar at a time or it would get over too soon! And the time we had forgotten a couple of bars near the window in summer to find that the chocolate had completely melted. Had cried as we could not eat the chocolate, though no amount of admonishing could stop us from licking the chocolate! Though dark chocolate remains my guilty pleasure, I do enjoy stealing a bite of milk chocolate now and then. A little sweet, but still good! I had a couple of bars of milk chocolate a friend had given. I did not really know what to do with them, and then I remembered these brownies on Deeba's blog. I had the perfect excuse to bake these for the kids to take on a holiday. A good make-ahead dessert on the move! These brownies are very rich, chocolaty, fudgy and yes, just a tiny bit on the sweeter side. Just the thing for your little ones this Valentine's Day? Or simply as a break from the usual dark chocolate brownies to bring back some childhood memories ? Adapted from Passionate About Baking, the recipe here. These are from the book 'Baking With Friends' by Kathleen Kings, owner of Tate's Bakeshop, New York. Recipe on the site here. Preheat oven to 180C / 350 F. Mise en place. Line and lightly grease a 9'' square tin with aluminum foil or baking parchment leaving an overhang. You could use an 8'' tin for taller brownies, but you baking time will be a few minutes more. Sift the flour and cocoa. Keep aside. In a medium sized heavy saucepan, melt butter and chocolate gently over low heat (on your stove-top) until just melted says the original recipe. Stir gently to mix evenly, then leave to cool slightly. Please read note. Scrape the mixture into a medium sized bowl. Add the sugar, gently whisk to incorporate. Whisk in the eggs and vanilla gently. Add the flour mixture and stir in till well incorporated. Spread evenly into the prepared tin. Bake for about 15 -16 minutes or till the center is very slightly gooey when a toothpick is inserted in the center. ( I like them this way!) Do not over-bake, err on the side of under baking rather than over baking them. Leave tin on cooling rack to cool completely. Gently lift the brownies from the pan (along with the foil) and cut into 16 squares. Store airtight to retain the moisture in the brownies. I loved them fresh and warm from the tin! These tasted best the day they were baked, though they still remain moist and good later. Make sure your chocolate is chopped fine. If the chocolate is not properly and completely melted, your brownies will not have a good texture. Given that milk chocolate is more sensitive, it can be tricky. I was a little apprehensive about melting milk chocolate along with the butter. I have melted the butter (on the stove top) till it almost melted, took off the heat, added the chocolate and stirred . With heart in my mouth, very briefly put back on very low heat as the chocolate did not seem to start melting fast enough. Later I had to press my spatula here and there to melt some pieces, but all was still well in the end. Could have done a better job, try your preferred method of melting chocolate, a double boiler may be the safest bet. Tell me how you did this if you try these. I may try substituting a tablespoon of the flour with cocoa to cut down on the sweetness, but the amount of sugar will be the same. Add some toasted walnuts or almonds to the batter if you like. Too much of heating of butter may make your brownies greasy. 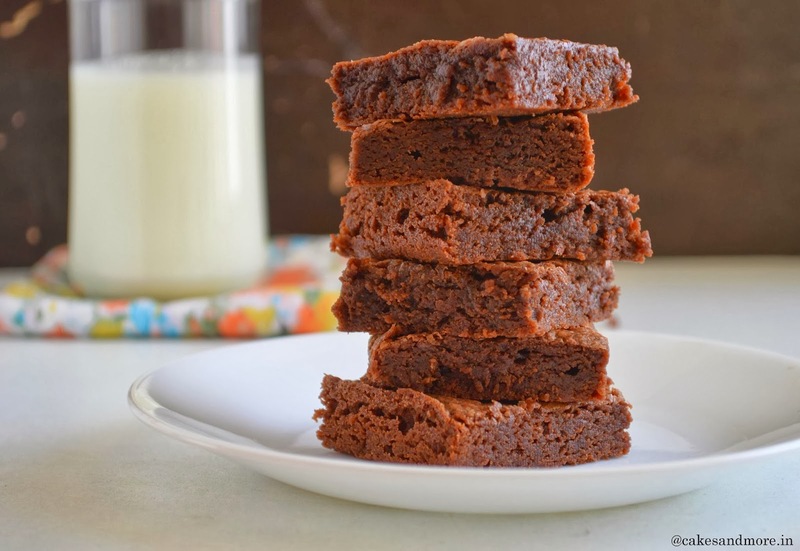 Goes without saying that good quality milk chocolate will give you better tasting brownies. Make these once for a change and don't shy away from admitting that you did enjoy milk chocolate brownies!